It is the third day of #beautybrawl16. To keep up to date with everyone's post for the beauty brawl, you can use the hashtag on twitter and instagram! 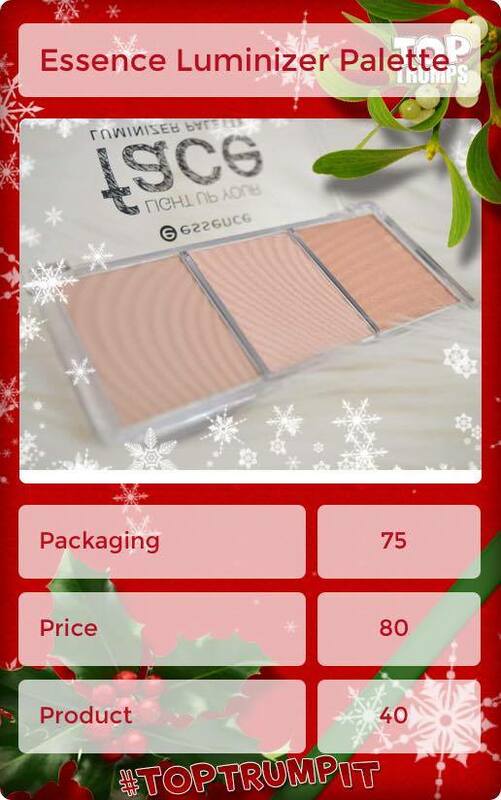 The third day of the Christmas beauty brawl is highlighter and today I am sharing with you a highlighter which I was kindly sent by Essence which is the Light Up Your Face Luminizer Palette, You can find Essence products in Wilkinson's, and they're such a cheap brand for good quality, it's definitely worth trying their products. I had never tried this brand before however I have always browsed through their stand every time I walk into Wilkinson's and I'm so glad I've tried their products now! I'll definitely go back and try some different products. I really like this product because of how blimming beautiful it is. The shades are absolutely stunning. There is a slightly matte shade, however the other two are shimmery. I love how there's three different shades which can be applied on specific areas of the face. The packaging isn't exactly incredible amazing, however it's simple, you can see through the lid to see the product and it's sturdy, so for the price, I'm not too fused about the packaging. I always leave my highlight till last when doing my makeup! Apart from lipstick of course, and I simply use a fan brush and dust the middle shade across my cheek bones and eyebrow bone. It's as easy as that! This highlight isn't extremely pigmented, but it does give you a very subtle bit of shimmer to your cheeks and that's what I love about it. Although having an extreme highlight can be incredible sometimes, when you're going to work you need something a little bit noticeable but something that isn't "bam, in your face" sort of thing. And this is that product. It gives you enough when you do not want to wear a lot of makeup! I cannot leave this out. This palette is so so powdery. It's probably the most powdery product I have ever used. There is so much fall out and it can be a bit of a pain to use. I personally wouldn't use all of the shades in this palette either, however I'm sure someone out there would. This is an okay palette if you're just starting off with makeup. It's affordable, it provides you with three different shades of highlight (where you can apply all three at the same time as well) and it's very subtle. Although there is a lot of fall out, this can easily be sorted so it isn't a big issue. For a high street and affordable brand, I'd definitely say it's worth trying out if you want a highlight which isn't too noticeable. (It would be perfect for school).